Long used as an aid to traditional manufacturing, 3-D printing is coming into its own as a unique means of mass production. Step inside one of the region’s top printing studios and explore how this Crystal Lake team has been printing its way into the next big thing for more than two decades. Mike Littrell, founder and owner of CIDEAS, in Crystal Lake, shows off some of the products his team has printed. In his hands is a model heart that was 3-D printed for a medical school to prepare cardiac surgeons for an operation. Mike Littrell always considered himself a tech geek, living on the cutting edge of computer technologies, but this was something entirely unexpected. His father, a bit of a tech geek himself, had just returned from Memphis on a consulting trip. He handed his son a round, plastic part. “Take a look at this,” he said. The younger Littrell was unimpressed. It looked like an ordinary plastic part. “I’m like, ‘What?’” recalls Littrell. This was the mid-1990s, when 3-D printing technology, to the layman, was still solidly in the realm of science fiction. But this? This was science reality. Littrell was intrigued, so much so that he set aside his graphic design and website hosting/design businesses to go all in on a nascent technology. Two decades later, he’s still living on the cutting edge of a technology that’s rapidly evolving – in practical use and in the public conscience. Today, 3-D printing is revolutionizing the manufacturing and product development processes, and it’s touching an increasingly diverse range of industries, from manufacturing to health care and Hollywood. Since 1998, Littrell has built his CIDEAS, 125 Erick St., in Crystal Lake, into a thriving firm with specialties in 3-D printing and its related engineering capabilities. 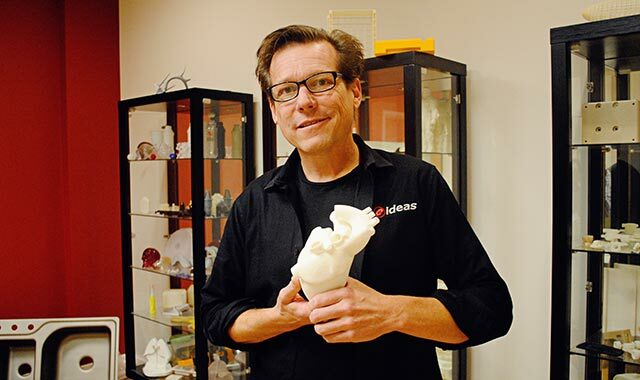 He’s outlasted competitors and, because of a tireless dedication to innovation, built CIDEAS into one of the nation’s largest service bureaus for 3-D printing. Printing in three dimensions isn’t so dissimilar from printing in two. Your office probably has a dot matrix printer or a laser printer for high-speed and high-volume prints. Inside, a print cartridge deposits the image of your document onto a piece of paper. Your home probably has an inkjet printer, which similarly deposits ink in an oscillating flow. In 3-D printing, an engineer’s design is translated into three dimensions by a machine that gradually plies layer upon layer. Like two-dimensional printers, there are numerous approaches. The very first form of 3-D printing, stereolithography (SLA), was patented in 1986, though the idea has roots in late-1970s Japan. In the SLA process, a laser traces a shape onto a photosensitive resin. Exposure to the focused laser light solidifies the traced area. Layer by layer, the laser traces a form upon the liquid. “Look at your coffee mug,” says Littrell. “The SLA system takes a three-dimensional representation – a 3-D CAD model – of that coffee mug and slices it into very thin layers. The system reproduces those layers. The laser will trace the layers of the mug, one on top of the other, until the mug is completely rebuilt. Another common process, fused deposition modeling (FDM), works like a hot glue gun, but instead of glue sticks, the 3-D printer is equipped with spools of plastic thread similar to a string trimmer. The printer head melts thin strands of filament, layer by layer, to create a finished product. Still another process, selective laser sintering (SLS), works like silk screen printing in that layers are rolled on top of each other. First, a roller picks up fine nylon powder and applies it to the workspace. A laser beam melts a pattern into the powder before another layer of powder is rolled on. Capturing fine details is easy in 3-D printing because layers can be extremely tiny – as little as 0.0006 inch in the PolyJet process – yet another printing technology. And parts can be big, too. The industrial-quality printers at CIDEAS are capable of producing pieces up to three feet wide, two feet long and three feet tall. Because it builds things layer by tiny layer, 3-D printing is capable of creating intricate designs that would be more challenging for traditional manufacturing methods. The applications for 3-D printing are virtually endless. Offices, hallways and conference rooms at CIDEAS are filled with a wide array of products printed in-house. Look around and you’ll see the bust of a U.S. president, movie characters, anatomical parts, product samples, sculptures – all of it 3-D printed. In one office, there are displays of geometrical shapes, whimsical turtles and a realistic-looking car that’s almost entirely printed. A friend of Littrell’s designed it to mimic a classic car once owned by his father. The technology behind CIDEAS was initially referred to as rapid prototyping because it enabled engineers to quickly test design concepts and production feasibility, or to present new ideas for focus groups and corporate board members. 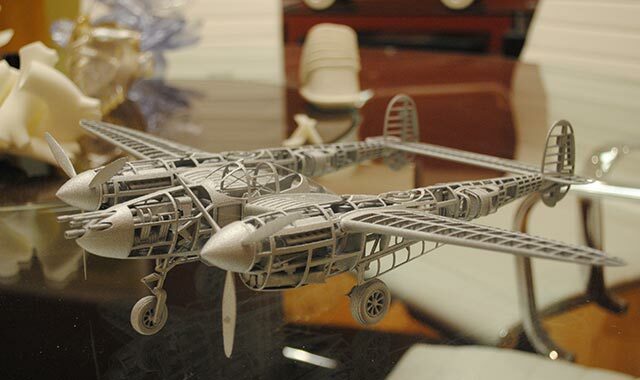 Littrell estimates that 3-D printing currently touches 90 to 95 percent of all products on the market. Littrell shows off sample soft drink bottles that are clear and topped with a cap. It’s hard to tell these were printed in the shop. In the corner sits a realistic-looking kitchen sink, which was also 3-D printed. As much as it helps product marketing, rapid prototyping is especially beneficial during the design phase. Seeing a part in plastic helps engineers to verify that their design actually works. Along a wall in the conference room, Littrell points toward a series of plastic frames for a handheld medical device. These were early verification models for a device that tests babies’ hearing. As CIDEAS and other innovators are discovering, 3-D printing technology reaches far beyond the realm of product design. When it comes to complex designs, low-volume work and one-offs, 3-D printing now offers an economical alternative to traditional manufacturing. New applications are unfolding in the medical field, too. Doctors can model a patient’s anatomy, using CT scans, to study a patient’s heart, spine or other part before making an incision. Littrell holds up the shiny cross-section of a mouth. The technology has plenty of other implications, too. Watch a medical show on TV and you’ll also see 3-D printing at work, as the doctors crack open a patient’s chest to perform open-heart surgery. That “patient” is likely a 3-D printed skeleton, overlaid with artificial, manmade organs and tissue. The technology has also helped hobbyists, like the professional engineer who built his cosplay suit from 3-D printing, and the model railroader who built a custom engine on a printer. 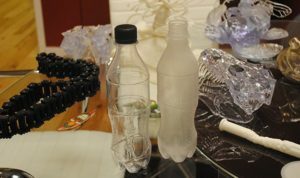 With a little post-printing finish work, the CIDEAS team can transform an opaque soft drink bottle into a shiny piece that looks like the real thing. In a sense, CIDEAS isn’t so dissimilar from Kinko’s. The 13 employees at CIDEAS work alongside more than 30 industrial-grade printers that represent five separate manufacturing processes. Like paper and ink, there are plenty of choices. Identifying the right process for the job usually involves a conversation between the client and their CIDEAS project manager. Customers typically provide a Computer-Aided Design (CAD) file in order to receive a printed part. Those that don’t have access to CAD programs turn to the engineering team at CIDEAS, who can construct 3-D drawings when needed. They also review the client’s files like an editor proofreads a writer. Printing machines move slowly as they construct their product layer by layer. In some cases, the machine may run for 30 minutes, while in other cases it may run as long as five days on a single job. Compared with traditional prototyping and manufacturing, which can take weeks or months, 3-D printing reduces the time to market by nearly half, says Littrell, and it can help to eliminate costly mistakes. Depending on the process used, some parts may need a little extra time to cure. Those will head to an ultraviolet light oven that, over the course of an hour, hardens the part. Most parts need a little cleanup before they’re ready for final use. A sample cola bottle, for instance, comes out looking cloudy and powdery. For it to look like a clear, shelf-ready soda bottle, it’ll have to head to the finishing studio, where several workers sand, prime, paint, polish or otherwise finish the piece. Littrell promises an average turnaround of three days or less – a big promise, but one that’s easier because of his location in McHenry County. With clients located around the country, Littrell has a full-time messenger who ferries parts around the greater Chicagoland area, including southwest Wisconsin and northwest Indiana. Ask Littrell about some of his favorite projects and he’ll probably tell you about the time he 3-D printed an iceberg. And no, it wasn’t an actual piece of ice, nor was it solid plastic. Artist Inigo Manglano-Ovalle has made a career at the intersection of art and technology. In the early 2000s, he was looking to create an artistic representation of an iceberg, using 3-D topographical scans from an ice chunk floating off the Canadian coast. Simplifying the iceberg’s coordinates, the artist created a sculpture made from hundreds of aluminum pipes connected by 531 joints. When traditional manufacturing methods proved to be too complicated for this exacting design, Manglano-Ovalle reached out to CIDEAS. And this was 2005, when 3-D printing was still an obscure technology to many. “The funny part about this project is that if we’d done this five years ago, I’d be on the cover of Time Magazine,” Littrell jokes. For Littrell and his team, innovation is a lifestyle. In some sense, nearly every job pushes the bounds of technology. But Littrell is still looking ahead to the next big thing. It’s a mindset that’s provided a competitive advantage in a growing marketplace. Littrell has invested in innovations both big and small. He’s participated in at least five beta tests within the industry and created his own production line for the filaments his team uses in the FDM process. He’s also developed industry breakthroughs, starting with an online quoting system. Dissatisfied with what was on the market, Littrell built his own system from the ground up. The CIDEAS True-Quote system, available at the company’s website, buildparts.com, now allows a user to upload a CAD file and receive a more accurate estimate. Littrell hopes to market the software to other 3-D printing companies. As innovation tends to happen, it was the creation of True-Quote that led to yet another breakthrough, one that has Littrell ecstatic about the future of his industry. Littrell says the new technology is under development and his proof of concept machine is currently building parts. The technology, he says, is different from anything on the market today. Littrell stands next to a model engine built from 3-D printing. The soles of his sneakers were also printed. Take a closer look at the sneakers on Littrell’s feet, specifically the white sole and the gray heel. The intricately woven supports inside those heels reveal a surprising secret: they’re 3-D printed. Because they’re printed, no other pair in the world is quite like these Under Armour sneakers. In the printing industry, such production is known as mass customization. The materials are the same, the design is the same, but the final print is a personalized variation. The concept has applications across the spectrum – think custom cellphone cases, eyeglass frames and hearing aids, for starters. Go back 20 years ago, and most hearing aids came in standard sizes. You could order a custom aid, but that meant taking a mold of your ear and paying someone to handcraft your new fitting. Now, a hearing specialist takes a mold of your ear, scans it into a computer and creates a custom CAD file for your unique fitting, which is quickly produced inside a 3-D printer using FDA-approved materials. Littrell believes the technology will continue to advance over the next several years as product designers continue finding new applications for 3-D printing. He sees increasing opportunities for metal printers and new materials better suited for end-use production parts, including materials better suited for human contact. Ever the innovator, Littrell is doing his part to encourage the next generation of 3-D printers. He opens his studio to students at McHenry County College and he supports Crystal Lake’s Prairie Ridge High School with materials and site visits. Students at area universities count on him for parts on their Formula SAE race cars. Meanwhile, Littrell and his team will continue blazing the trail in a rapidly evolving industry. This entry was posted on Tuesday, January 9th, 2018 at 12:00 pm	and is filed under Northwest Business Magazine, Top Posts. You can follow any responses to this entry through the RSS 2.0 feed. Both comments and pings are currently closed.